Jogging is the secret to long life and studies have already confirmed it. According to this study, joggers tend to live a longer life than non-joggers and hence, if you want to stay fit and healthy, then starting regular jogging could be the best thing to do. Making regular jogging a part of your daily routine can help you to stay fit, healthy and longer. The time and duration of jogging is completely upon you to decide as per your preference and availability. Ideally it’s better to jog early in the morning, because your stomach will be empty and you will enjoy the freshness and sunshine in the morning. If you are planning to start making jogging a part of your daily routine and wondering how and where to start, then here’s the post worth reading. I am regular jogger and for me, jogging is divine. And today, I am sharing the list of 21 most essential jogging tips for beginners. But even if you are a seasoned jogger, these jogging tips can be of great help to you as well. I personally prefer to jog early in the summer mornings as the sun is much soothing at that time in comparison to the other times of the day. And, as far as winter jogging is concerned, if I find that mornings are too cold, I often go out for evening jogging. However, more than deciding the jogging timings, what is important for you to note is to know the simple and easy tricks of jogging to get maximum health benefits. This is because wrong postures or techniques may affect your back or knees or cause other injuries which may have long term consequences. So, you need to be careful especially if you have just started jogging. To make things easier for you, I am sharing a few of the essential jogging tips for beginners that’ll help you to maintain a fit and healthy body. So, if you are determined to start jogging and do it with perfection, then here’s the post you can’t afford to miss. But, you will be able to enjoy all of the benefits of jogging only if you can do it correctly as studies have already shown that doing it wrong may be as dangerous as leading a sedentary lifestyle. Moreover, do not try to overdo things from the very beginning. Just try to increase your stamina slowly and then buck up your pace. My jogging tips for beginning to maintain a healthy and fit body will definitely be a proper guide to you. So take note of the steps carefully. I will try to cover up most of the important aspects of jogging for beginner so that you get a clear idea of what needs to be done and how. So, are you ready to start jogging? I guess you are, so let’s begin with the discussion. Any exercise if performed wrongly will have negative impacts on health and jogging is no exception to this. So, it is important that you follow the right jogging techniques and do it with perfection to stay fit and healthy. When you follow the tips and techniques correctly, you can get into your desired shape and lead a healthy and happy life. Listed below are the basic but most essential jogging tips for beginners to maintain a healthy and fit body. Warming-up your body is very important before starting jogging or any other physical exercise. This is because when you are jogging, your muscles undergo contraction and relaxation constantly. So if you do not prepare your muscles beforehand, you may end up having muscle cramps and may not be even able to walk or jog properly. Warming up is not just important before jogging but also needed to be done before any type of exercise and the reason is same for all of them. A few minutes of brisk walking or free hand workout should help you to prepare your body for jogging. Please do a bit of warming up by doing some basic stretching so that your muscles get prepared for the endurance training that you are about to do which in turn, will help you to prevent injuries while jogging. Loosening up your body before jogging is also important because it helps in relaxing all of the tension from your neck, shoulders, arm, legs, feet etc. This will also enable you to jog for longer duration without having any kind of muscle cramps. So, just shake your hands and feet a bit to loosen your whole body. You can say it to be a part of the warm up session that I just recommended to you. Setting your own jogging goals is important and that will keep your motivated all through your jogging performance. The goal may be set daily or weekly as per your capability but you must try hard to live up to your own expectations. Like for example, set a goal that you will run about 2 miles on the present day and will try to run 5 miles at a stretch by the end of the month. Having a clearly defined daily, weekly and monthly jogging goal can be a great source of motivation for you. However, try not to set unusual goals for yourself as putting too much pressure on yourself all of a sudden, right at the very beginning may lead to too much of exhaustion and harm. It is best if you can judge your stamina and potential and then set the goals accordingly. Ideally you should have smaller goals for daily run and increase it proportionately the following weeks. Wearing proper running shoes while jogging is a must and it is one of the most important jogging tips for beginners. The reason is because shoes give you proper protection to your bones and feet from the impact of the thrust, they undergo while you are jogging and running. So, please select some comfortable running shoes for jogging. You may even consult an orthopedic doctor if you want to use orthopedic shoes while jogging. Avoid jogging in sleepers, because you may end up injuring yourself. And prefer shoes that absorb the jerks. Using right kind of running shoes can actually make jogging fun for you. Maintaining right kind of body posture while jogging is very important, and hence when you are jogging, you need to keep and maintain correct posture. Many joggers tend to slouch and jog which not only is incorrect but may actually lead to injury in your spinal cord. So, whenever you are jogging, you need to be sure that you are keeping your chest out and your shoulders must be rolled back to avoid any kind of injury to your spinal cord. If you start jogging with a lot of intensity all of a sudden, then that might cause injuries and you may end up tiring yourself too early. So, it is recommended that you start slow and then adjust the speed of jogging as per your comfort and stamina. Ideally, you should start with walking and then after 30 seconds, increase your walking pace. After that, by the end of 60 seconds, you must be brisk walking. Then start your jogging at slow pace and increase the pace slowly. This is a good technique and prevents you from burning out fast which in turn, will enable you to jog for longer distance and duration. One of the other jogging tips for beginners is to make soft landing while jogging. This is because if you stomp your feet, there is high chance that you will injure your knees. So, it is highly recommended that you land softly on the ground on the balls of your feet as this will enable to dissipate the shock and not hit your knees directly. This will further enable you to jog comfortably and for a longer distance. Using proper breathing techniques while jogging is an important step and you must use correct breathing techniques to continue jogging for longer distance. This is necessary as you will have to breathe constantly at a particular rhythm in order to pump enough oxygen into your cells. Also, if your breathing is not perfect, it will lead to muscle fatigue and that will not allow you to jog for longer duration. So, you need to count your steps and continue breathing in and out in synch. Like for example, for four steps, try to breathe in slowly through your nostrils and then, for the next four steps, exhale through your nose slowly. And, when you are feeling too much fatigued and feel like giving up, start breathing the air in through your nose and exhale through your mouth with force. This technique will be very helpful in pumping in oxygen and pumping out carbon-dioxide from your body quickly. Did you know that you can actually increase your jogging duration by talking to yourself? Well, you may find it weird, but it’s true. Let me explain; physical fitness is undoubtedly important in order to jog for longer time but there is something else that helps you to continue jogging for long, and that is your determination. You should always keep motivating yourself that you can do a little more and that determination will help you increase your stamina quickly. So, whenever you feel like giving up, simply talk to yourself and make yourself believe that you can do it and achieve your target today. You may often feel like giving up, but when you have set a target for yourself and you keep yourself motivated, you’ll be able to reach the goal for the day. May sound like a small hack, but give it a try and thank me later. Another way to keep yourself motivated to jog for longer duration is by constantly competing with yourself. You need not worry about how well others are performing and just concentrate on beating your own records. Competing with others many a time involves lot of tension that tends to affect the performance. But when you are your own competition, there is a very healthy relationship with yourself, and it helps you stay motivated to perform better with each passing day. You should try to jog in lateral and zigzag motions and keep changing your directions frequently as that will train the muscles of your leg to run on any kind of road or trail. You will be able to run both uphill and downhill quite comfortably and also on rocky tracks. Moreover, this will make the coordination between your brain and body excellent and will also help you burn all your extra flab. However, initially you may run on an even and straight surface only, when your confidence increases, you may start experimenting. Ideally, if you have set a goal of running 10 rounds of the ground, then you should take 5-6 rounds in clockwise and remaining 4-5 rounds in anti-clockwise direction. See, once you become a pro and is able to run in various directions and surfaces, then it is great. But, if you are just beginning, then you may avoid uneven or rocky and hard surfaces. This is because your feet may fall in a hole or a crack and you may end up breaking your bone. You should start experimenting once you gain the confidence. If you are determined to improve your stamina for jogging longer, then try to practice box jumps. This is very good for strength conditioning and in improving your muscle power and reaction time. Box jumps train your leg muscles. It also helps in strengthening your thighs and glutes that enables you to jog for more miles at a stretch. Unless your core is strong, you will not be able to jog for longer time at a stretch. So in order to strengthen your core, try out planks as it will help you a lot in increasing your core body strength. You can start with doing 3 sets of elbow planks of 30-60 seconds and slowly improve the strength of your core. One of the very effective ways to improve your jogging is to time your steps. Set a goal to jog for at least 30 steps before you take the rest. Increase the number of steps once you get more comfortable with jogging. There is no need to jog continuously at a stretch when you have just started with jogging. So, please do take breaks in between. The interval training will help you jog for longer time without getting too worn out. Looking for landmarks is a great strategy to help you jog for a longer period of time and is one of the most important jogging tips for beginners. This actually enables you to decide when you need a break or when you got to walk instead of running. Basically, fixing landmarks help to make your jogging very systematic. If you are not drinking enough water throughout the day, your body will become dehydrated which in turn will wear out your muscles. You must drink minimum 4-5 liters of water on a daily basis. Also, make it a habit to keep a small sipper with you when you go out jogging so that your system remains hydrated and you are able to jog for long. However, please do not drink a lot while jogging. Taking a couple of sips is ok when you are taking a break. Sleep is extremely important for jogging as it helps to recover and rejuvenate your muscles. See, when you are jogging, your muscles undergo wear and tear and when you are sleeping, your muscles get rebuilt and become stronger and better. Also, lack of sleep gives a feeling of fatigue, which also affects your performance while jogging. An average adult must have minimum of 7-8 hours of sound night sleep. If you are having issues falling asleep, try out these hacks to fall asleep faster. Most of us do exercises because we need to do it to remain fit and healthy. So, it is highly possible that you may feel lethargic and become very irregular with jogging. Now, that is never going to help. So, you need to keep finding ways to stay motivated and one way to stay motivated is to change your jogging routes. To be more specific, you may try to find jogging trails having beautiful scenic beauty so that it kind of acts as an encouragement for you to jog as well as enjoy the scenic beauty. I mean I understand that this is always not possible but you can definitely give it a try and see whether it goes in your favor or not. You need to continue with your jogging in all weather conditions unless the weather goes to extreme limits. To be specific, you must do jogging both in summer and during winter. You just need to take proper protection and continue jogging. Like, in summer months, you may avoid the hottest hours mainly the hours between 10 am to 4 pm as the sun is soaring high up in the sky during that time. And, as far as winter is concerned, you can protect yourself with warmer clothes. It is preferable that you wear the dresses in layers during winter as that keeps you warm. Also wear hats, gloves, scarf etc. to keep yourself covered. And, yes, when you are running, the temperature of your body will rise and slowly you will not feel too cold. You may however, avoid jogging in the rain or find out cover spaces to run. I do not want you to catch cold by getting wet or slip and fall. But, to stay fit and active, you can consider doing the indoor exercises during rains. Over to you: which is your favorite jogging trick? Not everyone is gifted with a perfect body or good health. Most of us have to strive hard to achieve it. It is not just applicable for normal people like you and me, but is same for celebrities as well. They work even harder to look perfect and stay healthy. So, the moral is if you want to have a desirable physique and enjoy a healthy long life, you need to get rid of excess fat and prevent other diseases from occurring. Now, exercise and proper diet are the two best and natural ways to remain in shape and out of all exercises, jogging is one which cannot be ignored. The list of benefits of jogging is many and in order to enjoy all of them, you at first, need to get your jogging right. The reason I mentioned is because when you are doing any exercise wrong, it can actually cause adverse effects on your health. Like for example, wrong jogging posture may lead to problems in your knees or your spine. So, if you are a beginner in jogging, you need to be extra careful and use right tips and techniques to get it right. 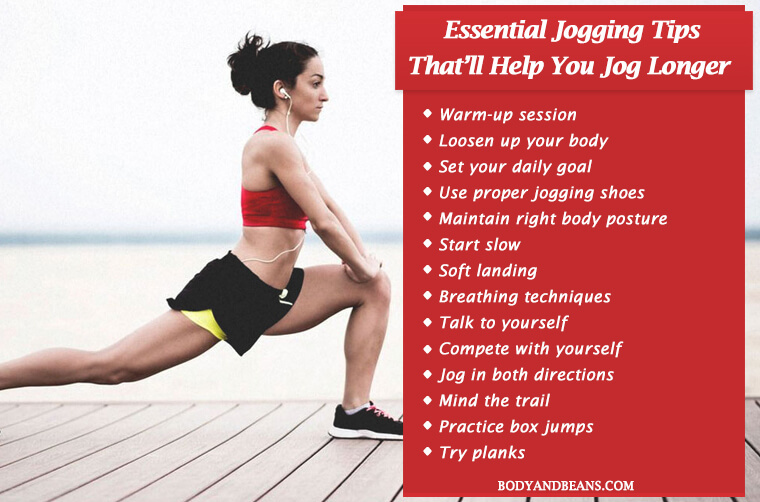 I have already shared the 21 essential jogging tips for beginners and if you follow these tips closely, I am sure you’ll be able to jog for long hours and longer distance. The list covers most of the important aspects, so I am hopeful that if you are following the tips properly, you will not face any harmful effects. I am a regular jogger,are you? If yes, then how has jogging helped you? Share your experiences and feedbacks on jogging in the comments section below. Also, if you know any other important jogging tip, feel free to share that with me. And, if you like my posts, please like, comment and share it with others. Until then, you stay fit and keep jogging.